TAKE NOTE BAND Program (After School), teaches children, grades 3-8, instrumental music with an emphasis on jazz. 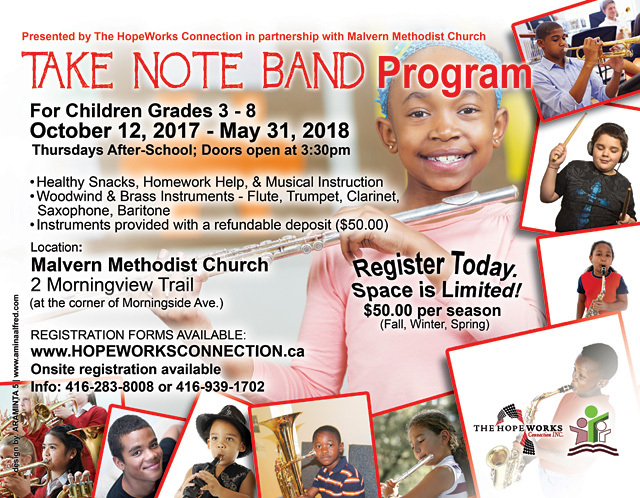 Children experience belonging, build healthy self-esteem, develop collaboration and leadership skills while learning to play brass, woodwind or percussion instruments in a band setting. TAKE NOTE is more than just music. Children also receive homework help and a healthy snack as part of the program.